Throwing a graduation party? Celebrating an anniversary? A Rhino Shelter Decorative Party Tent can provide perfect sun protection for any type of outdoor event. With the side panels attached you've got an attractive house-style canopy that provides a sense of privacy while still allowing for air circulation, and without the side walls you've got a sturdy, more traditional canopy that gives your guests almost 200 square feet of shade to relax in. It's up to you to choose the number of walls your gathering requires. Like all Rhino Shelter products, this Decorative Backyard Party Tent delivers durability along with practical style. This model is constructed with high-quality steel and strong polyethylene fabric, meaning that your tent's ability to serve will remain consistent over time. And because everything comes ready to assemble - you don't even need any tools - you'll be able to start enjoying reliable and convenient sun protection in no time. Can I install this on a deck or does it needed to be staked? While this tent could possibly be anchored to a hard surface, the manufacturer recommends using grass or a soft surface as a base. Unfortunately, this item is not waterproof. About how many people can fit in these dimensions? Thank you. This tent will hold around 21 people if standing. It will hold around 15 people if sitting and standing. What is the diameter of the poles? Are they 2"? The poles measure 1 5/8" diameter. 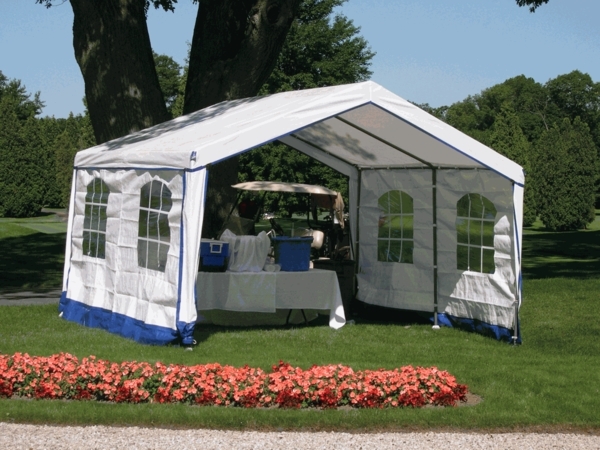 Can you purchase two additional sides for this canopy to make it completely enclosed? We do not carry the individual sides for this brand, you will need to contact the manufacturer directly for extra sides. Are there any other sizes? Also, does it come with four walls? This tent does indeed come in other sizes: Rhino Shelter Decorative Backyard Party Tent with Side Walls - 14 x 20 x 9 Rhino Shelter Decorative Backyard Party Tent with Side Walls - 14 x 27 x 9 Rhino Shelter Decorative Backyard Party Tent with Side Walls - 14 x 32 x 9 These only include two sidewalls. The ends are always open. How many sides are included? Two side walls are included.